A chance post on social media got us intrigued by Italian showjumper Luca Marai Moneta, an international rider with unconventional methods. Following his 2013 Puissance win at Olympia, which landed him on the front cover of Horse and Hound, we were determined to meet him and find out more about his horsemanship approach. 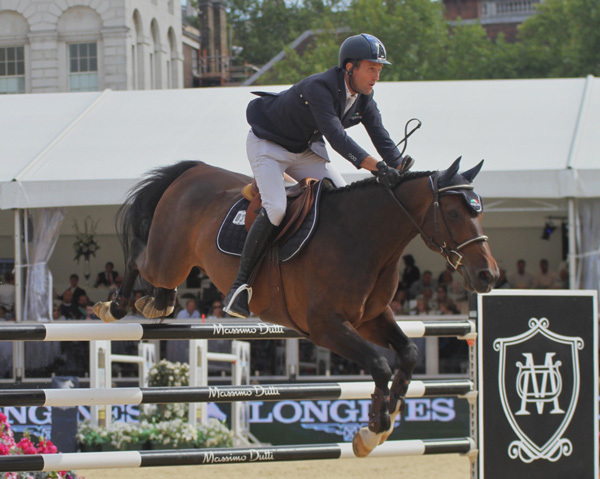 We caught up with him at the Longines Global Champions Tour in London. HJ: Luca, how did your horsemanship journey begin? I began riding at a young age, like many people do, and soon was jumping up to 1.45m competitively in the traditional way. I was not able to afford expensive show jumpers and was riding horses owned by others. One day, at a competition in the UK, I picked up a magazine with a front cover that astonished me. The rider was jumping barrels with no saddle or bridle and I wondered how this could be? Back in Italy I found a Parelli instructor and began learning the Parelli basics. I became very interested in this method of training horses and quit competitive riding completely. With new eyes I began to seek more knowledge and spent three months at a time with Pat and Linda Parelli in America. 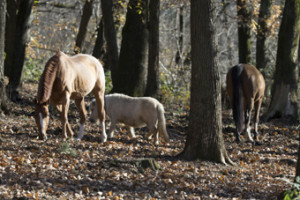 I continued to practice my new found skills at home and owners started coming to me with ‘problem’ horses to re-school. Before long I was training with renowned showjumper Michel Robert and started to compete again on these retrained horses that had been labelled as difficult. HJ: What’s your favourite training method? Depending on the mental pathways of the horse I use a combination of positive and negative reinforcement techniques, although I don’t use a clicker. I use positive reinforcement when training certain horses to jump to encourage them to bascule over a fence. When the horse makes the correct effort and shape, I reward with whatever treat they like. Quova de Vains likes carrots and will make the correct jump for the reward. This is how we won the Puissance in 2013 at the London Olympia horse show. I start slowly developing the mental pathways of the horse and make a deal with them - if they perform when I ask them to then I allow them to be horses in their down time. It is my goal to unite equine ethology and sport at the highest level. HJ: How do you enrich your competition horses’ lives while travelling around Europe? We have a network of stopovers all around Europe to rest the horses while travelling. The rest stops have fields and paddocks for the horses to be turned out in instead of them always being stabled. Jesus likes to play football so we use this to relax him before a competition or instead of schooling at home. Sometimes we longe the horses or take them for a hack. HJ: How are your horses different from other top showjumpers on the circuit? My horses are allowed to be horses at home. They live in small herds, are often unshod, and training between competitions can involve liberty work and play. They all have different abilities and personality traits. Neptune wants to be the leader so we play games to allow him to believe this and he is happy. In 2014 we successfully competed in the Global Champions tour with the best riders in the world. We took Neptune Brecourt to the World Equestrian Games and have a super team of horses at Grand Prix level. The Olympics in Rio is next on the list to aim for and I hope the horses continue to stay happy and sound. HJ: When you come back to London for the Puissance again, will you ask to compete in just a neck strap? I asked before if I can compete without a bridle but your British Showjumping forbids this. At home in Italy I compete some of the horses at 1.45m in just a neck strap. NEPTUNE BRECOUT 2001, Selle Francais gelding - Cumano x Kayack “He has definitely taught me not to make assumptions. He is not a constant horse, and my awareness and respect of this nature is perhaps the only fixed point between us. There is no rule with him - the only rule is that there are no rules!